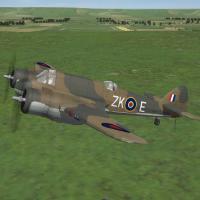 This pak contains mods for the Dev A-Teams Bristol Beaufighter Mk.1F and NF Mk.1F (Radar equipped Nightfigher), as seen in Western Europe (ETO) from 1940 onwards. This is the first of several SF2 upgrade packages for the various Beaus they've produced. This is a semi-complete aircraft mod, and as per DAT directives, the aircraft lod is =NOT= included. So, those users that cannot access the DAT downloads, you're advised to skip this, as it's of no use to you. Everything else, minus guns, is included. This package contains 2 aircraft, as listed above, and below. from their WW2 Aircraft Downloads section. You =WILL= need them, to copy/paste into THIS aircraft's folder. It should be noted the Mk1_R8.lod is the same as that's available in their WoA mod. 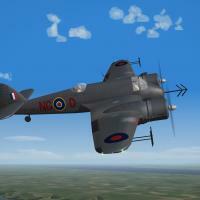 End Users that have the original aircraft, either from WoA or seperate downloads are advised =NOT= to install this package over an existing aircraft folder. See "To Install" for full explicit instructions. The skins from my Home Grown Template , and remain in their bmp format. New decals were created as needed for serials, plane-in-group letters and others. The serials are 'generic' in nature, as they represent no particular aircraft within the units depicted, but ARE for the model variant represented. Weapons (bombs) and guns are NOT included; you should have them already. All markings are decals; this will allow super easy creation of other squadrons by simply creating a new SCode decal, and decal randomization is set to TRUE. All the 1stGen Hangar and Loading screens were either rebuilt to SF2-spec, or created new for this package. They are in jpg format, and fit SF2 styling. Damage textures are new, in DDS format. As always, fairly easy to follow, yet detailed install instructions are included. PLEASE read them!!! Especially the Notes section. All the original DAT readmes are included, for historical and ownership/copyright purposes.